Have a healthcare digital marketing question? Jump to the bottom of this page. Boasting a whopping 2.8 billion active users, it’s clear that your audience is on social media. 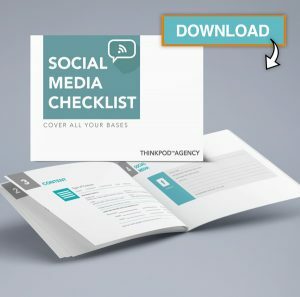 You can plan each post strategically with this all-in-one checklist, the checklist that will help you cover all of your bases. How are businesses building trust online? Blogging for your business, and the many benefits. Blogging…yada, yada, yada. Everyone talks about blogging – but isn’t it just an overused tactic that produces little results? SEO: Are you overlooking this marketing secret weapon? ThinkPod Agency is an 18 year old inbound and digital marketing, website design, and HubSpot Certified Partner focused on 100% trackable and measurable results. Let’s get started with a 30 minute confidential marketing assessment.